When we decided to start gardening in our small balcony,the first thing I wanted was a Basil pot.Now,whoever knows me know that I do not have a green thumb at all,but basil pot I wanted to have.Ajay,does not have a green thumb but a full green hand,no kidding.He can spend all his time sitting on the swing and enjoying the fruits of his labour. Suma and Deeba were sweet enough to send me basil seeds which helped me finally have a pot of basil:)When I took out the leaves and looked at it,I had absolutely no doubts regarding what I was going to do with it.Yes,pesto it was. I haven't tasted Pesto yet,so not sure if it is supposed to taste like how it did.First of all the ingredients for an 'authentic' pesto were hard to find.I mean,pine nuts and parmesan cheese,really?Ok,the cheese is available in gourmet supermarkets but I wasn't going to take all that trouble for something which I haven't tasted and something which I was unsure whether we'd like or not. I am not a big fan of raw garlic,so maybe that is why I didn't like it smeared on a bread.But it tasted great in Pesto Rolls(recipe coming soon! ).For now,here's my super simple recipe which gets done without any exotic ingredients and tastes great. 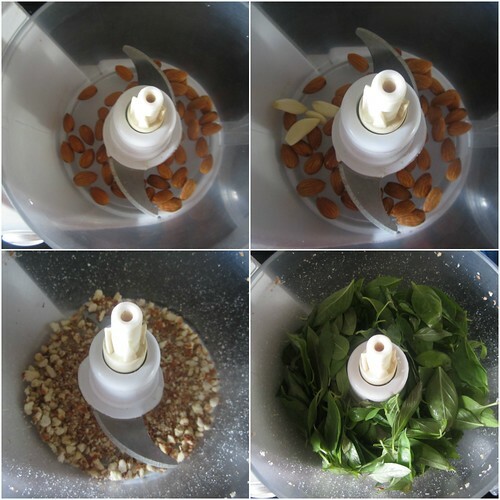 In a food processor/blender add the almonds and garlic cloves and process till you get a coarse mixture. 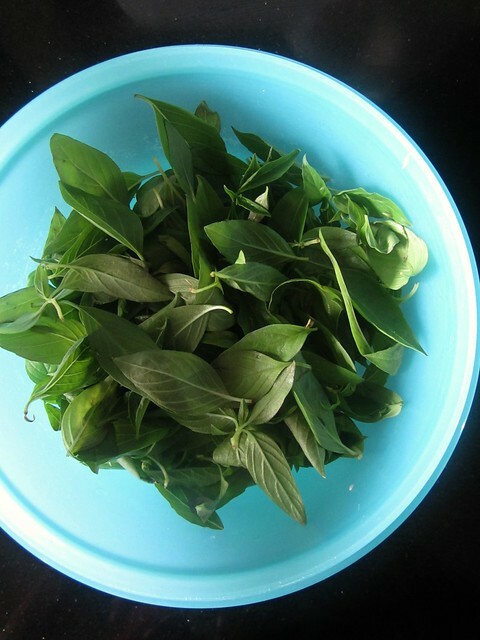 Add the basil leaves and start processing by pouring olive oil through the feed to aid even grinding. Mix in enough salt and pepper to taste. 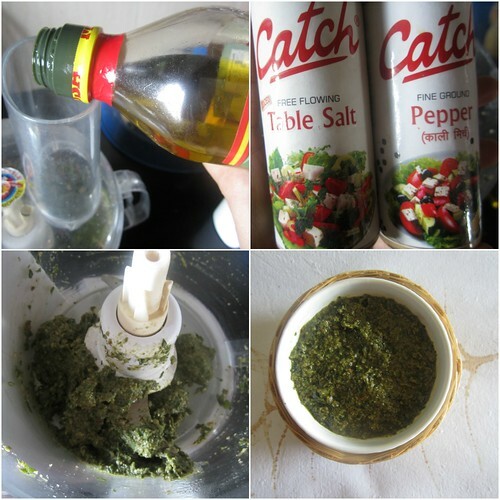 Pesto is a very forgiving recipe,you can add/substitute ingredients of your choice.Walnuts can be added in place of Almonds and throw in some cheese if you have and create different flavors each time. Pesto tastes great in Pasta too,just toss some cooked pasta in pesto along with some cream.Simple yet delicious. what else can a food blogger ask for other than these kind of simple pleasures..I hv been planning from ages to have my own basil,not yet implemented..love d pesto anytime. 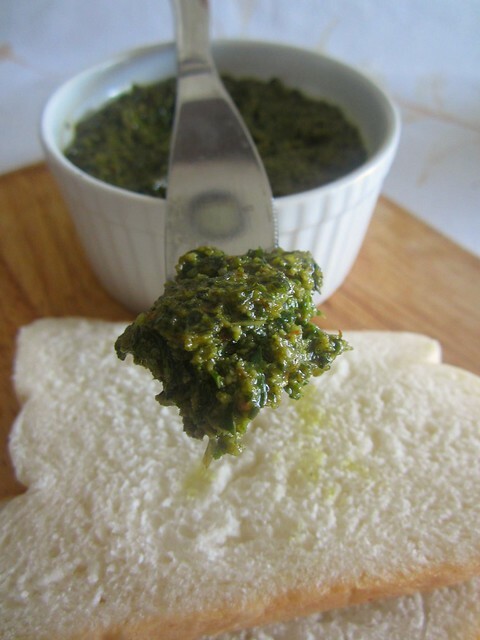 mmmm...a fresh basil pesto!!!! I love it.. Looks tempting. Thats looks really tempting, surely must ve tasted wonderful as well. Will try this soon sometime, Thanks for sharing. Like u divya i too havent tried pesto or tasted even after travelling so much... funny eh! This one looks so green and yum! I m planning for my small herb garden and stil not worked on it! I envy that Basil plant of yours. I attempted to grow Pudina couple of times, but in vain. Its far more rewarding enjoying the fruits of labour! 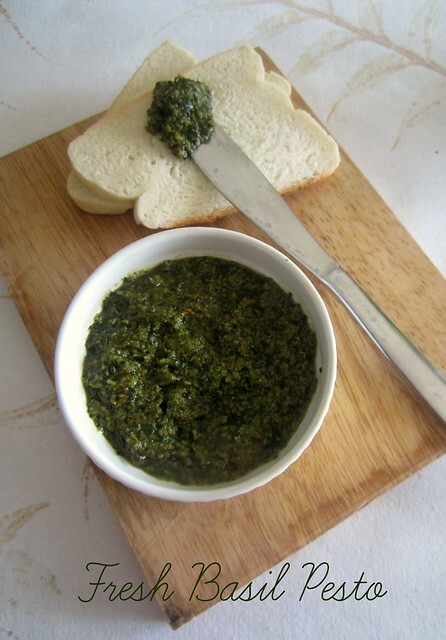 Beautiful Pesto!